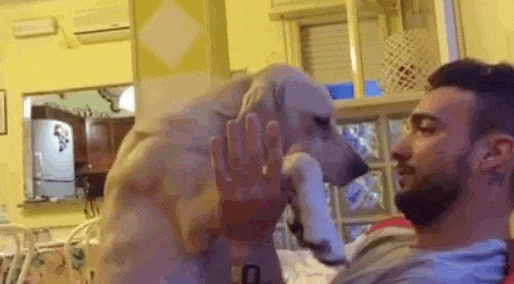 Even if our dogs don't understand all the words we're using, they definitely know how we're feeling — and this pup can tell his dad is not happy with him. Facebook user Anthony Federica Granai, who lives in Carrar, Italy, recently had a back-and-forth with his dog over an unknown wrongdoing. Granai shared a video of the pup attempting to get back into his good graces. 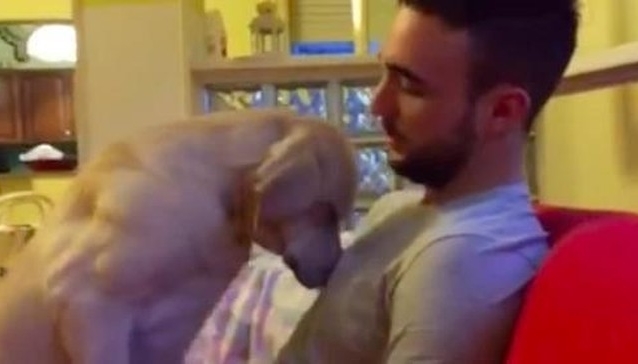 Ettore knows his dad is mad at him and he needs to fix it, so he apologizes the best way he knows how — with cuddles. He decides to climb straight up on to Dad's lap. Anthony still doesn't give in ... so Ettore amps up the begging for forgiveness with even more intense snuggles. And finally, FINALLY his dad relents. "OK. We make peace," he laughs in Italian. That's right bros, hug it out. The whole thing ends with a big hug and melted hearts. NOTE: Seventy-four percent of dog owners believe that their dogs experience guilt. One owner described her reasoning as follows: "I behave in a particular way when I feel guilty; my dog behaves in a similar way in equivalent circumstances; I know intuitively that my behavior is motivated by guilt; therefore the behavior I see in my dog is also accompanied by feelings of guilt.” Almost sixty percent of dog owners claim that their dogs' guilty behavior leads them to scold their dog less. Responses to "Apologetic Dog Asks For Forgiveness With A Hug"
Miles, smart and loving are all dogs, cats, etc. Dogs do not feel "guilt". They think and feel like dogs, not people. It normal for dogs to jump, chew, bark, etc. They do not understand that as "wrong" behavior. They know it is safe to do when you are not home and not safe to do when you are home. But they know when we are mad and it makes them feel scared and they are begging us to love them again even when they do not know what they did wrong. The best way to deal with the situation is to prevent it from happening. It is your responsibility to put your shoes away, keep the dog exercised enough and not suffering from boredom, or chewing out of loneliness or whatever the issue is. WHY WOULD ONE WANT TO GO TO HEAVEN IF YOUR ANIMALS AREN'T THERE?